Designed to fit smaller faces, the Kaiman Exo swimming goggles from Aqua Sphere feature plexisol lenses with anti-fog and anti-scratch treatments for excellent durability and visibility in the water. The EXO-Core technology with Softeril® gaskets ensures top-notch stability and comfort, whereas a silicone split strap with micrometric adjustment buckles delivers a close and comfortable fit. The goggles provide a 180-degree field of vision and protect your eyes from harmful UVA and UVB rays, which makes them suitable also for outdoor swimming. for submitting product information about Aqua Sphere Kaiman Exo Small Fit Swimming Goggles - Clear Lens We aim to answer all questions within 2-3 days. 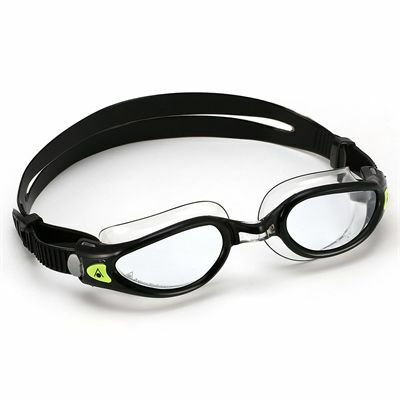 for submitting product information about Aqua Sphere Kaiman Exo Small Fit Swimming Goggles - Clear Lens. We aim to answer all questions within 2-3 days. If you provided your name and email address, we will email you as soon as the answer is published. I have only used them a handful of time, but so far it feels that they are just the right thing for me who usually struggles with panda eyes. for submitting product review about Aqua Sphere Kaiman Exo Small Fit Swimming Goggles - Clear Lens.